This post is part of our special coverage Europe in Crisis . 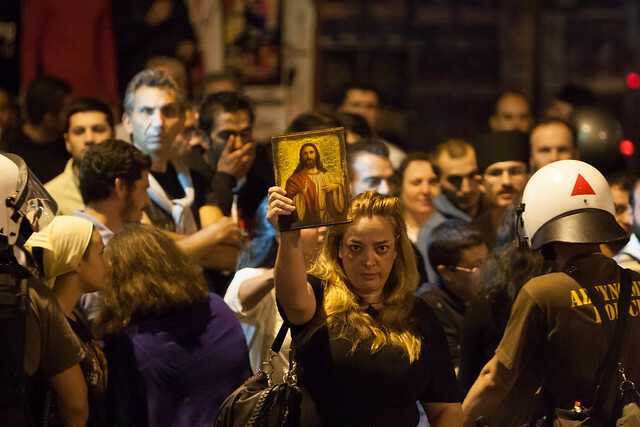 Religious groups and neo-nazis protested against gay-themed play Corpus Christi  in Athens on 11 October, 2012. Deeming it blasphemous, they assaulted a theater critic  and forced the cancellation of the performance. He was attending the premiere and tweeted his experience immediately afterwards. Netizens reacted in shocked outrage, demanding an end to the unchecked spiral of violence perpetrated by neo-nazis in recent months. @zairacat : απορρίφθηκε η αίτηση ασφαλιστικών μέτρων παραθρησκευτικών οργανώσεων, κατά της παράστασης corpus christi. κανονικά απόψε η πρεμιέρα. @zairacat : Religious organizations had their request for interim measures against the Corpus Christi play thrown out. The premiere will go on tonight. @zoemavroudi : Tweeps point out attacks outside of gay-themed play in Athens tonight is 1st organized Golden Dawn targeting of Greeks instead of migrants. @IrateGreek : #Greece  #rbnews  LPC @KHatzinikolaou : Theatre owner: Last time a play had police guard was in Junta, don't want to believe it's Junta again. @CrippleHorse : Ι am Greek. In my country, the government, the police &the justice system have let loose Golden Dawn, a Nazi gang, free to commit any crime. @nikoxy : Το σόου των νεοναζί στο θέατρο Χυτήριο αποτελεί πρελούδιο για τη μετα-ρατσιστική βία Χρ Αυγής. Οχι μόνο εναντίον ξένων. @nikoxy : The neo-nazi show at Chytirio theater is a prelude to Golden Dawn's post-racist violence. Not just against foreigners. @Kat_McKork : Ας αφήσουμε αυτά τα “πρώτα οι μετανάστες, μετά οι ομοφυλόφιλοι, μετά εσύ” δεν είναι αυτός ο λόγος, το “μετά εγώ”. Δεν πρέπει να είναι. Όχι. @Kat_McKork : Stop saying “first immigrants, then homosexuals, then you”, “then you” isn't the reason [to react]. It shouldn't be. No. @thesspirit : Πιστεύω στους θεσμούς κ τον άνθρωπο. Πιστεύω ότι η λύση μπορεί να είναι μόνο πολιτική κ ότι η βία γεννάει βία. Αλλά σήμερα πιστεύω λιγότερο. @thesspirit : I believe in institutions and in humans. I believe the solution can only be political, and that violence begets violence. But tonight, my belief is lessened. @tinaletina : #Greece  2012, Nazi & state violence: some will give up, some will leave, some of us will stay n defend our dignity and lives. Fighting back. Check out more curated tweets and links  on this story by the author on Storify.